This year I was invited to speak the RDA (Riding for Disabled Association) South East conference after running the 2014 London Marathon to raise funds. Although a little daunting presenting to so many people, also a very useful day to meet other volunteers and learn more about the charity across the region. So for anyone that either couldn’t make the day or is interested in learning more about the charity I thought i’d write a short blog post about what was covered. After our chairman’s welcome (Lindsay) our first speaker Amanda Jupp was from West Sussex county council discussing how local councils have funding available to support local charities such as RDA – she advised that every group should reach out to their local council and apply. Following Amanda was Tony from Netro42 who demonstrated the new SE region website, it has been modernised and now includes info for volunteers, links to social media, events, news, videos and of course info on local groups. It is now based on a CMS (Content Management System) making it easier for admin’s to update content. 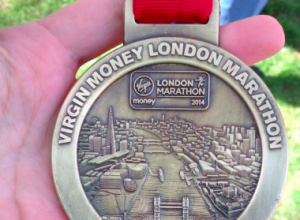 Following Tony was myself where I not only shared my experiences of running the London Marathon (I won’t bore you here but see previous posts if you are interested!) but I also talked about how social media was a huge part of my fundraising activities – it helped me make my friends, family & colleagues aware of my hard work (although no doubt to the point where I was annoying them!) but without social media I can’t imagine how much more difficult it would have been to reach my target! After my update we had Jeannie Knight, a freelance equestrian journalist (http://www.jeanniesequestrianworld.co.uk/) who shared her background but also gave hints and tips on how to publicise local RDA groups, for example she commented on how the majority of local newspapers are very short staffed so sending on an already written article with a high quality image is the best way to get published! She also offered to post any relevant content on her site as well as answer any further questions, so drop her a note if you are interested in hearing more. 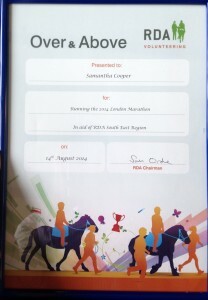 Following Jeannie was the amazing Sarah Baverstock who competed in the 2014 World Para-Equestrian Driving Championships, her story was truly inspirational! She shared her experiences from RDA through to today, how RDA, her friends and family supported her every step of the way. She shared pictures and videos of her experiences and absolutely made everyone in the room remember why they give up their time every week to support people just like Sarah!! The final speaker was Matt Cobble (from RDA National) talking about ‘volunteer of the future’, he opened by sharing a picture of RDA many years ago – we all recognised that the fundamental reasons behind RDA will always remain the same but at the same time we know that volunteers are adapting to a changing culture. He showed some stats around the number of young volunteers (<25 yrs) compared to retirees, today there are very few younger volunteers but this is and will continue to change. Young people want to volunteer, either as part of schemes such as Duke of Edinburgh or to build their experiences outside of education and helping their CV stand out! Interesting discussions about how to find to young volunteers and about how to offer flexible volunteering opportunities as not everyone can be available at the same time every week – particularly during normal working hours. 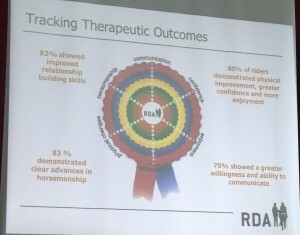 He shared some stats showing the outcomes of RDA, these are amazing and truly motivates volunteers! This shows the outstanding difference RDA makes to someone’s life. For those of you that know me well you will be aware that I have been volunteering at a local group on Saturday mornings, and although I literally know nothing at all about horses I can still add value and see the difference it makes to young lives. For me its not about knowing how to ride or look after a horse, its about seeing that young child’s amazing smile, their ability to learn so quickly and for some their ability to relax, forget about their exercises and lessons and just enjoy being in the fresh air with a horse! Now that is what gives me the motivation to continue to support RDA and next year I plan to run Brighton Marathon again raising awareness and funds for RDA. 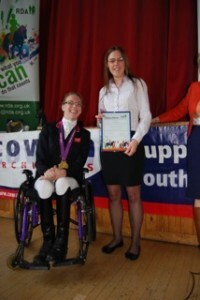 Finally it was closed with awards, presented by Sophie Christiansen (Paralympics champion winning 5 gold medals!) some absolutely outstanding stories! Individuals that have volunteered for many years, those that went over and above (somehow I won one of these! ), outstanding groups and one very special volunteer who had DAME JUDI DENCH come along to present her award! I still can’t believe that I was in the same room as Judi Dench!